O-2172 is a drug developed by Organix Inc, which acts as a stimulant and potent dopamine reuptake inhibitor. 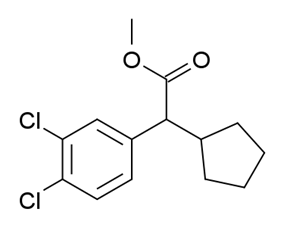 It is an analogue of methylphenidate where the phenyl ring has had a 3,4-dichloro substitution added, and the piperidine ring has been replaced by cyclopentane. It is around 1/3 the potency of methylphenidate, demonstrating that even with the important binding group of the nitrogen lone pair removed entirely, selective DAT binding and reuptake inhibition is still possible.